For this summary, we’ve prepared 2 charts. Some of the analysis comments that are spliced in to the charts, are slightly redacted to preserve space – and the greatly simplified charts we use for these updates contain no Elliott Wave markings, in contrast to the information-rich charts in the subscriber’s sections. Also, we don’t include every single update made during the time period, only the ones which contain new analysis conclusions or significant changes to the Elliott Wave analysis. On the 22nd of February, we warned that an overbought condition had arisen, and that a correction was imminent. In hindsight, the market traded sideways for almost 2 months after that call, but it didn’t immediately top out in the short term. On the 10th of March, we wrote that we expected the at-the-time ongoing minor impulsive wave, to advance slightly more, before a wave 4 correction would arise. On the 16th of March, we reiterated our call that a correction was imminent and that it would be shallow in depth and drawn out in time, and just two days afterwards, the NASDAQ commenced a new month long sideways correction. On the 27th of March, we warned that NASDAQ Composite was getting somewhat oversold even if not at a very strong readout, and this coincided with the market reversing significantly in the short-term. On the 11th of April, we wrote that NASDAQ Composite could be close to ending the correction, and that a move up to the 6000 level was imminent. Which is what subsequently occured. On the 1st of May, after the rally had surpassed 6000, we called an overbought situation and expected a correction. This happened, with the index moving net sideways the next 4 trading days, and doing so inside a formation that then resulted in a one-day mini-crash to the 6000 level. On the 22nd of May, we called for some minor upside, but that a top was forming and that risk was high. The market then advanced, and on the 29th of May, we suggested some more upside to a top, after a small correction. The correction occured the next day and was slightly less than expected, but the market did then turn up and advance to a new top some 8 trading days later, and then started a significant correction. A good call of not less than 3 wave formations. On the 26th of June, we suggested that the correction would end above 6050 within 5 trading days. This was slightly off, the correction actually had 7 days left to it, but it did stop above 6050. On the 3rd of July, we wrote that the NASDAQ Composite was nearing a significant oversold signal, and that the index would likely reverse soon. That is exactly what happened, a strong upmove ensued. 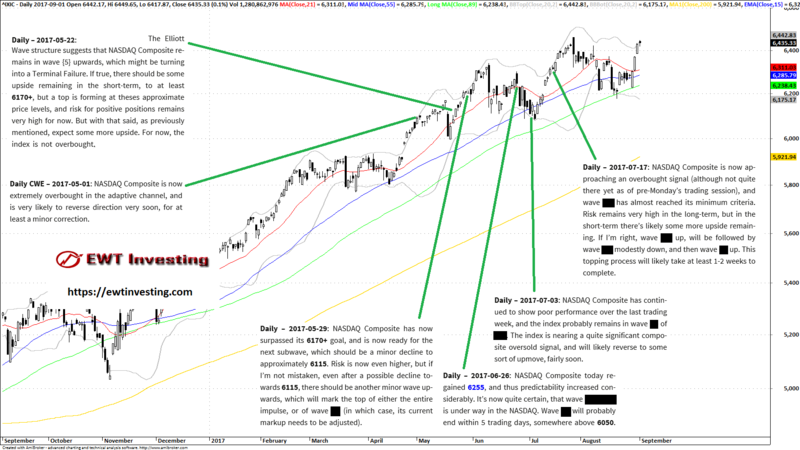 On the 17th of July, we wrote that the NASDAQ was approaching an overbought situation, but would likely slightly advance more to complete the uptrend. We also warned that risk was very high in the long-term. We’ll see how that bears out. The index did top out and produce a significant correction, but has rebounded since then. NASDAQ Composite has proven to be slightly more difficult to analyze than the S&P500, thus far during 2017. In our subjective opinion, during the time period summarized in this article, we did manage to be on the right track most of the time. We did periodically underestimate the strength of the underlying trend, and it remains to be seen if our assessments of high-risk situations will be borne out, or falsified. 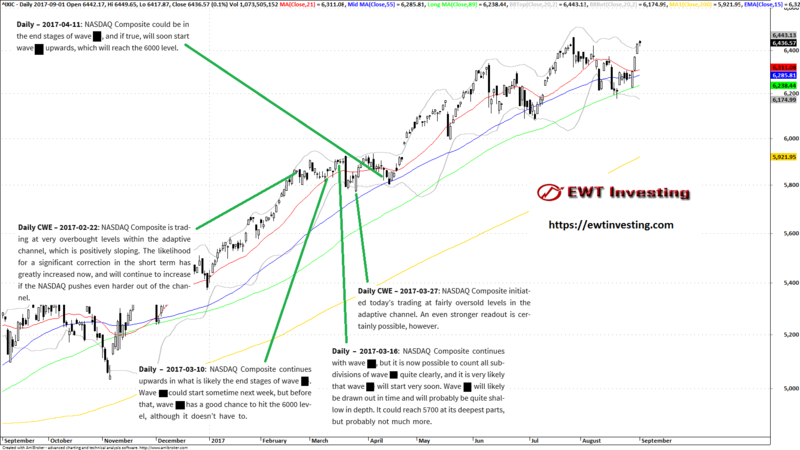 Our NASDAQ Composite Elliott Wave analysis section is updated 1x per week (usually on Mondays), and is included in our Global Elliott Wave Coverage subscription service.